Heritage Grounds Services were asked to take over a beautiful garden in Gerrards Cross. The customer had previously invested in a total garden re-design with another company, but were disappointed with the results a year after completion. It became apparent to the customer that the existing gardening team were not following the best horticultural practices, which had caused the garden to be slow to establish and was looking tired in places. 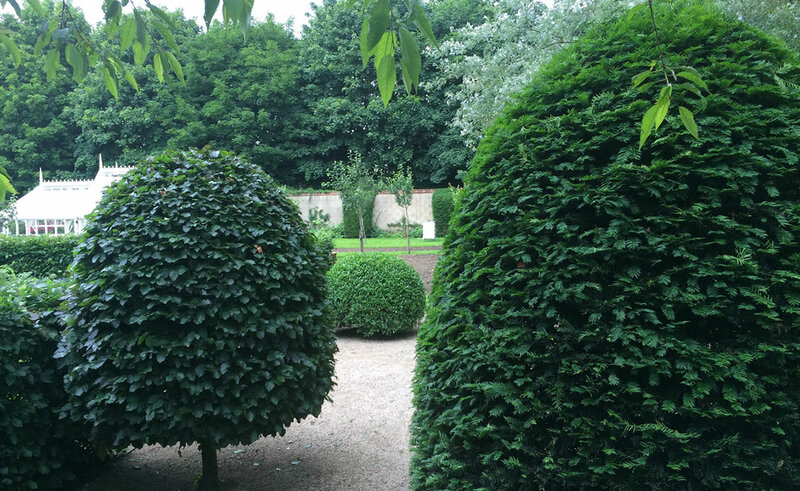 Once Heritage were appointed, our team immediately began by checking soil types and feed levels in the garden. We created a feed plan and agreed a management schedule for the garden. The correct feed and maintenance meant the plants, hedges, trees and shrubs all began to flourish, with spectacular results. At the same time, we scarified the lawns to remove the thatch and aerated effectively – the regular feed and pest treatments has achieved a lush green lawn, all year round. Cut lawns weekly between March and October (weather permitting), feed all formal lawns following a site specific lawn health plan. Treat weed and pest problems when required throughout the year, scarify and aerate lawns annually re-seeding when required. Sweep hard standing areas every visit ensuring no debris is left and any weed growth is removed. Apply herbicide to all hard standing monthly to ensure weeds do not establish and spread seed, this includes spraying the gravel drive way. Prune all specimen trees, hedges and topiaries as and when required, and in accordance with good horticultural practice, ensuring the specimens are looking there best throughout the year. Apply pesticide and fungicide treatments if any problems arise at any time of the year. Monitor and adjust irrigation as required once installed. Keep beds and borders free from weeds at all times, keep edges sharp and to the shape of the original design, monitor the irrigation and adjust to suit the plants and conditions. Prune plants when required by the species, report and replant when needed. Materials cost to be added as and when required. All areas to be fed with a slow release granular fertiliser twice per season, drench feeding to be carried out as and when required as an additional boost. We will remove and recycle grass cuttings and green waste, generated by our maintenance team. Heritage Grounds Services are experts in domestic garden maintenance. To find out how Heritage Grounds Services can help maintain your gardens, please call on 01895 438 811 today. Call our friendly gardening maintenance team to discuss our range of services. View our latest garden maintenance projects in Buckinghamshire. The following guides are available to help maintain your garden.